I featured this episode as #48 on my list of the 60 best episodes. Read my thoughts here. Here are scans of an interview that writer Carl Ellsworth gave on “Looking Death In The Eye” for The Chakram Newsletter: #14. Here is an on-set report of the production of “Looking Death In The Eye” from Titan: The Official XENA Magazine, Issue #9. 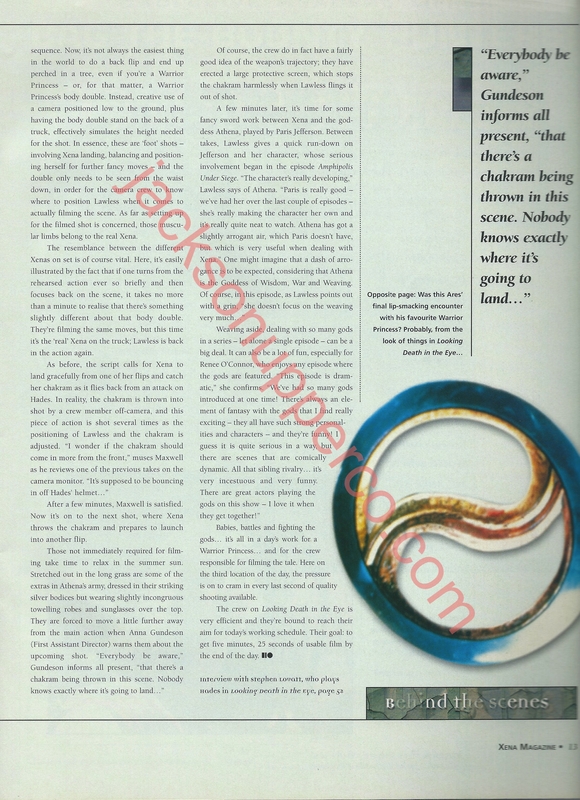 Here are scans of an interview that writer Chris Manheim gave on “Livia” for The Chakram Newsletter: #14. Here is an on-set report of the production of “Livia” from Titan: The Official XENA Magazine, Issue #10.